Featured problem area for this Tell The Truth Tuesday is this place behind the fountain. 'Easy Does It' is a fine rose, but it is proportionally too small for the space. There were three of them there; I added another, and several Liatris spicata clumps in front, but the proportion is still unsatisfactory. 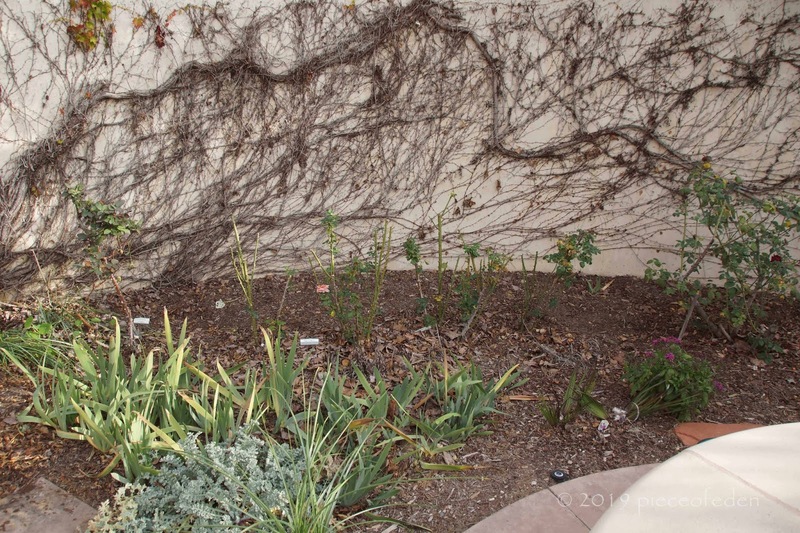 They are cut back for the winter, but are not much bigger at the end of the year--this cultivar would rather bloom than grow. Not big enough for the space. But rain! 3.25" during this series of storms! Do I pull them and plant some larger-growing roses? Or try something more imposing in the location, like Leucadendrons? I have not decided. 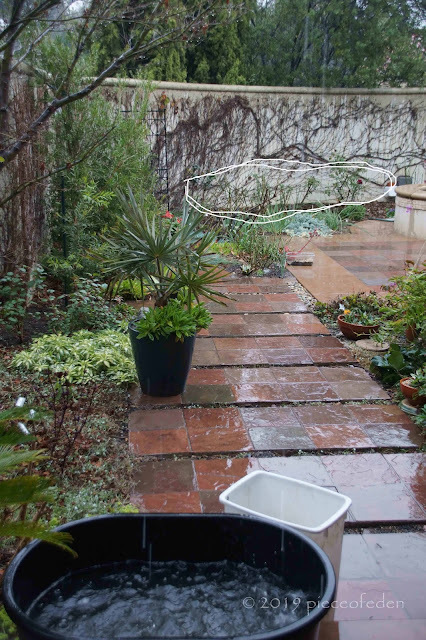 Speaking of the fountain, it needed the old rainwater cleaned out of it, which I did, but it has rained four days straight (very unusual) and filled again. 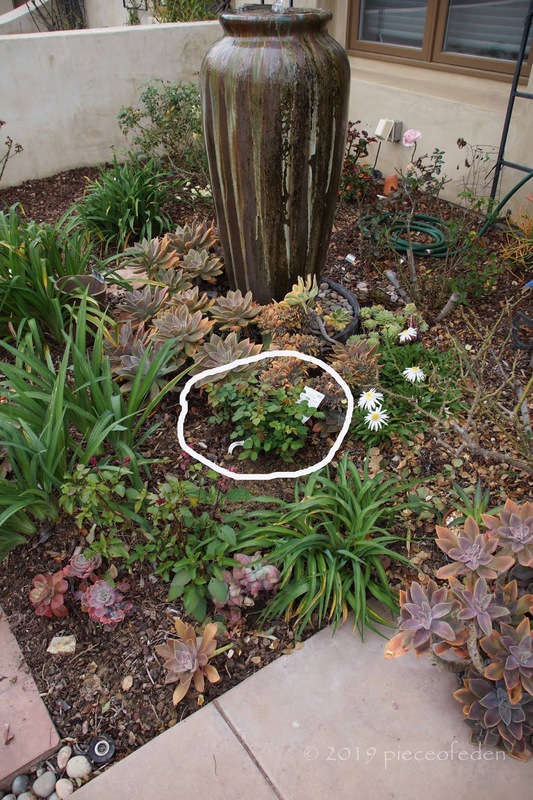 I stopped running the fountain and left it empty when the drought began, and have never installed a new pump. Several times I looked for someone to concrete-cut out the bottom, so I could use it as a planter for a specimen tree, but couldn't get anyone to do it. So, it sits, and that's the truth. 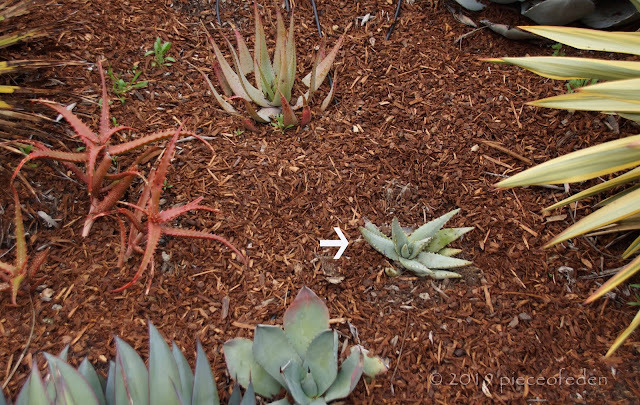 Speaking of rain, most every California gardener jumps when rain is expected, jumps to do some planting right before a rain, to help new plants settle in. I did just that before our several days of rain began. I pulled the very sad 'Munstead Wood' rose in this area, thinking to plant it elsewhere, but it had gall infection (a fatal disease), so out it went. Impulse buy rose 'Easy Spirit' took its place. 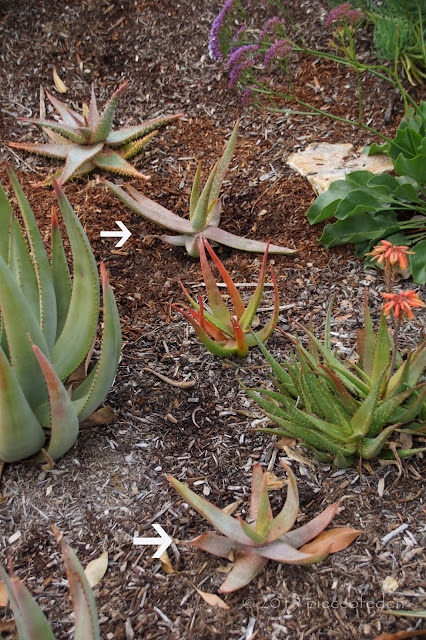 I went back to the same nursery where I found a bargain-priced Aloe buhrii and bought another, to fill out this front slope area a bit more. 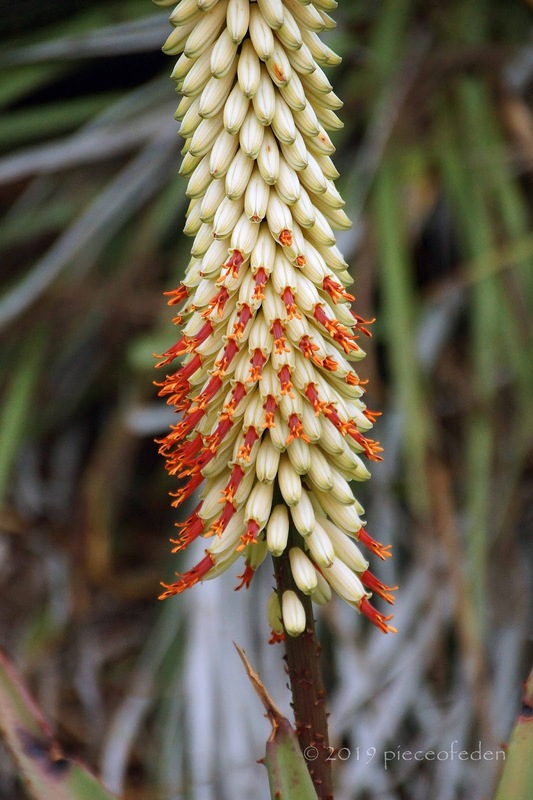 Aloe buhrii is similar to Aloe striata. Tell The Truth Tuesday is a meme created by Bonny Lassie. It's a fun way to consider what in your garden needs improvement. Since we're snow-covered at the moment, your green and wet garden, even with the flaws that only you can see, is glorious. I actually try NOT to cramscape, so living with bad proportions and bare soil while plants that promise to grow to a certain size sit, sometimes for years (it feels like years) is a certainty of my garden existence. Then the bare soil fills with weeds in the meantime. It's a frustrating juggling act. What's the vine on the wall behind the roses? When it leafs out, does it add a feeling of lushness? Mulch doesn't hold down the weed population? One thing I will say for drought--I didn't have to weed for four straight years. Nothing sprouted. I'm not a cramscaper either, though I love the look. Parthenocissus tricuspidata. Yes, major rich glossy green lushness, and drastically reduces reflected heat from the walls. I hope you can work out something on the fountain - it'd look great as a planter. You got more rain than we did it seems, not that I'm complaining. We picked up about 2.5 inches since Thursday and our total for the rain year to date is 12..52 inches. It's sunny at the moment but AccuWeather says we'll get a little more out of the current storm before it's out of the area and there's another chance of light rain this weekend. I'm not ready to file any complaints with Mother Nature but I do wish she would stretch out the intervals between storms a bit more. I managed a little post-storm clean-up yesterday afternoon. 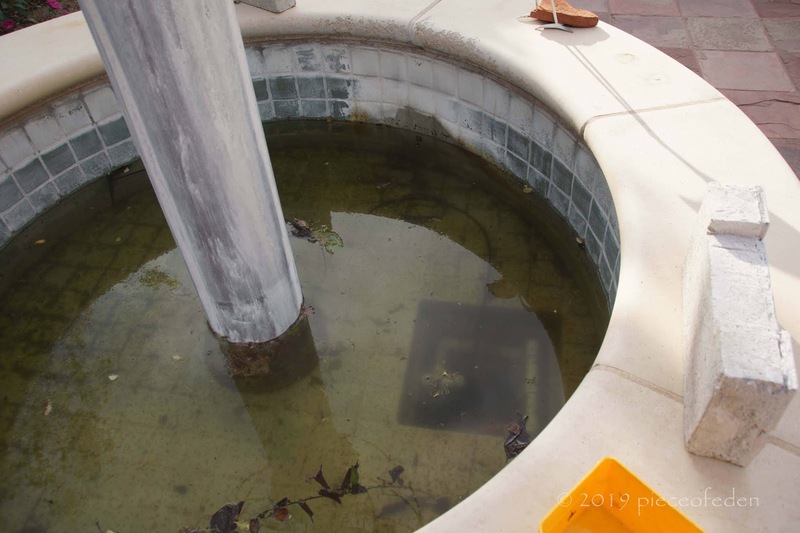 I don't think me and a sledgehammer is going to work on the bottom of the fountain, so it will take some effort. This morning its been sunning up, then it clouds over and pours for a few minutes. This has happened several times already. Intervals would be wonderful, but we have to enjoy what we get. The sound of rain, the fresh scent in the air, the sparkle on the foliage...it's good! We have drilled holes in the bottom of bird baths, large pots, etc. Have you thought about this? I don't think it took any special equipment. If you want specific info, let me know and I'll verify with my hubby. Also, probably more expensive, but we "core drilled" holes in our concrete counter top to hold umbrellas . . . .
A "core driller" was who I was looking for to do this--could not get one to come out. "We only do commercial projects" was the response I got. The concrete is thick, so it needs serious equipment. I bet that fountain looks good spewing water. I know in this day and age of drought no one wants to have one. Too bad. It would make a fabulous planter. What kind of tree would you plant there? Could you just have big holes drilled in the bottom? Even that would be difficult. Your fountain is too well built! I would do a crape myrtle (beautiful bark and flowers), an Arctostaphylos (Manzanita--ditto on the bark and flowers), or an Aloidendron (tree Aloe), any of those would be a striking patio-sized specimen in that location. The fountain is very well built. I might have to make it a fountain again for a while. It didn't use much water, actually. I should really do something. Either planter or fountain would be better than empty and unloved. Sounds as if the fountain wants to stay. Maybe it does! You could be right. Don't be so hard on yourself... But if you are looking for a replacement - are you familiar with the Ebb Tide rose? About 4' tall, blooms all the time, deep purple (which would enhance the Liatris), and the most amazing clove fragrance. Love the rocky backdrop though, so I wouldn't plant something too big. Can't wait to see what you do! Had 'Ebb Tide'. It was not a strong grower, and the plant was no bigger than 'Easy Does It' is. Loved the flower color. Have 'Twilight Zone' now which is the same wonderful color but not any more vigorous. Needs afternoon shade to protect that wonderful purple color.